The line diagrams presented in this section show measurements of the above-ground heights of selected frost-heaved bedrock features, along with corresponding sub-surface depth measurements. 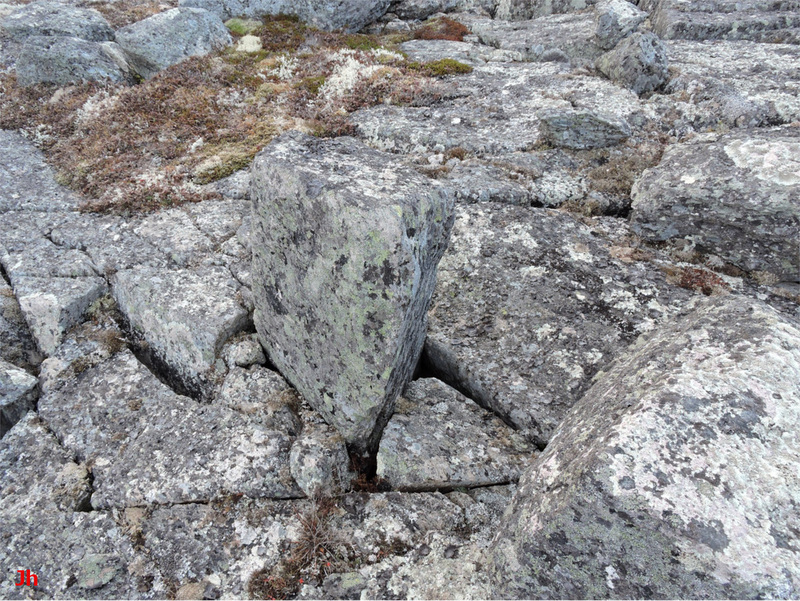 The preceding photo shows a frost-heaved joint block extending 144 cm above a disrupted bedrock surface. The surrounding bedrock has been shattered, eroded and shifted by a combination of frost-heave, glacial ice movement and fast-flowing runoff from melting glacial ice. 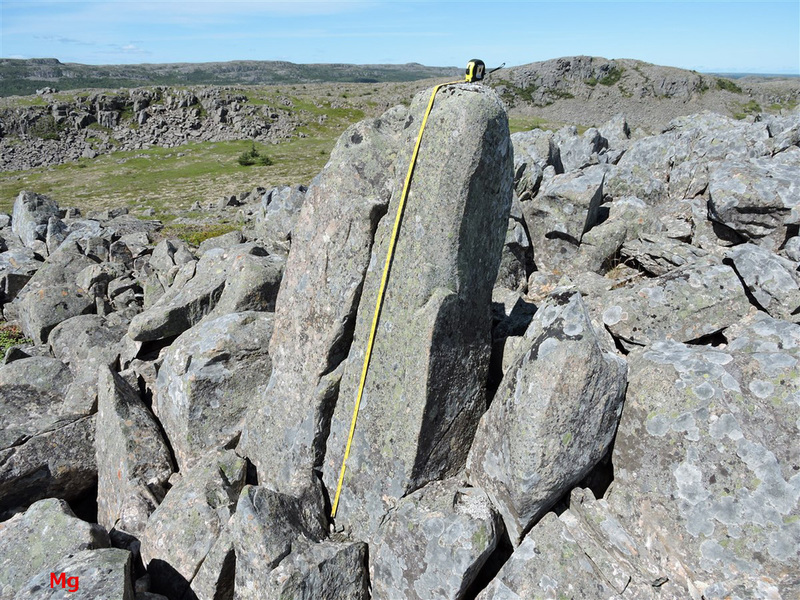 The base of the measured joint block extends downward into intact bedrock, confirming that the block is an example of frost-heaved bedrock, rather than a glacially-shifted block tilted upright by chance. Intact bedrock can be seen at the lower right of the photo, separated from two small frost-heaved joint blocks by a fissure. The bedrock surrounding the tall monolith conforms tightly around the base, even though this bedrock is fractured in several places. It was not possible to measure the below-surface portion of this specimen. The photo below shows a frost-heaved joint block extending above a fractured, but clearly defined bedrock surface. The intersection of two small fissures at the right of the specimen allowed access to the open space underneath the block. The block shown above was photographed from a low angle to provide a profile image (first photo below). Measurements of portions of the joint block extending above and below the surface, and of the hole from which the block was displaced, were used to compile a line drawing that was then set in correspondence with the profile image (second photo/diagram below). The above-pictured joint block had a flat bottom and a clearly defined rectangular empty space beneath the block, making this specimen an ideal candidate for measurement. 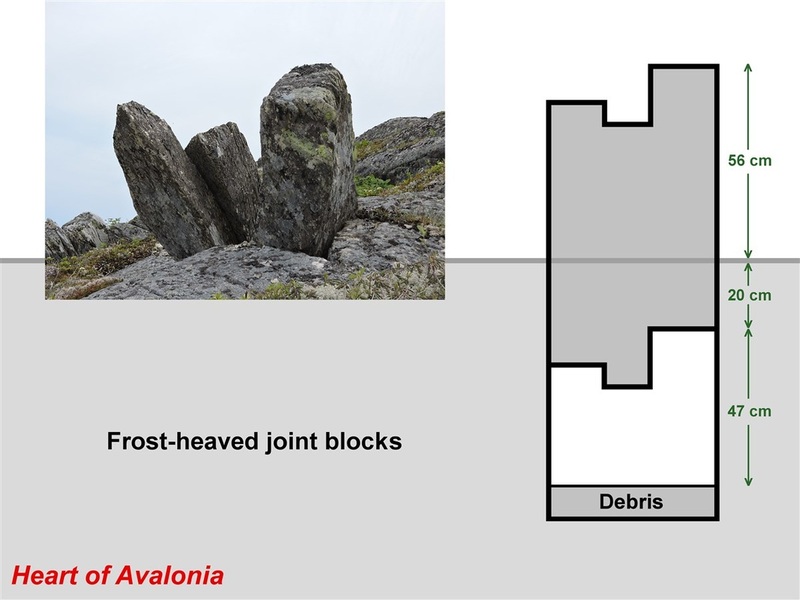 Most frost-heaved joint blocks either have limited access to the underneath portion, have irregular bottom surfaces or have the underneath space partially or totally filled with broken rocks, soil, peat or vegetation/roots. The following photos/diagrams show four more specimens where partial or complete measurements of the below-surface portions were recorded. 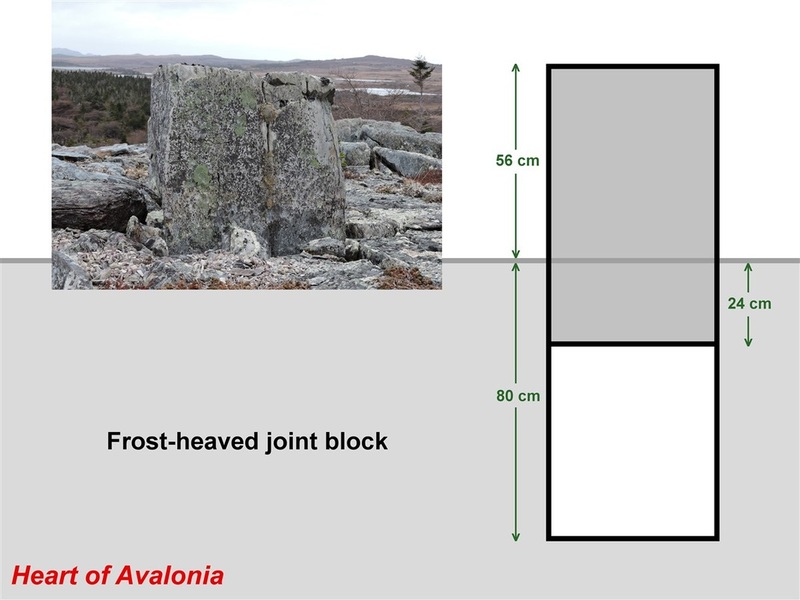 A second example of a well-defined rectangular frost-heaved joint block is shown above. 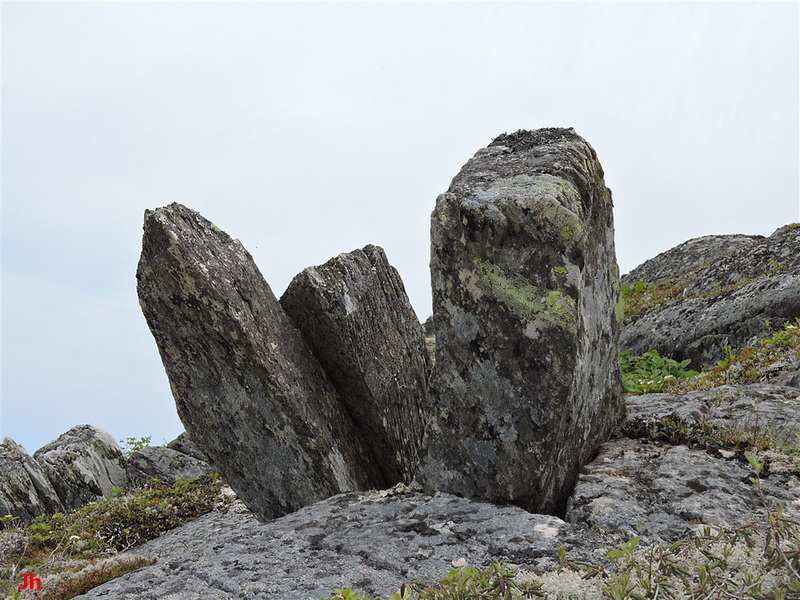 In this example, and in the previous example, the local bedrock possessed a strongly-developed 3-axis system of mutually orthogonal tectonically-induced joints. The bedrock illustrated above was sedimentary (siltstone) while the previously illustrated specimen was formed in volcanic bedrock (rhyolite or metasomatized rhyolite). 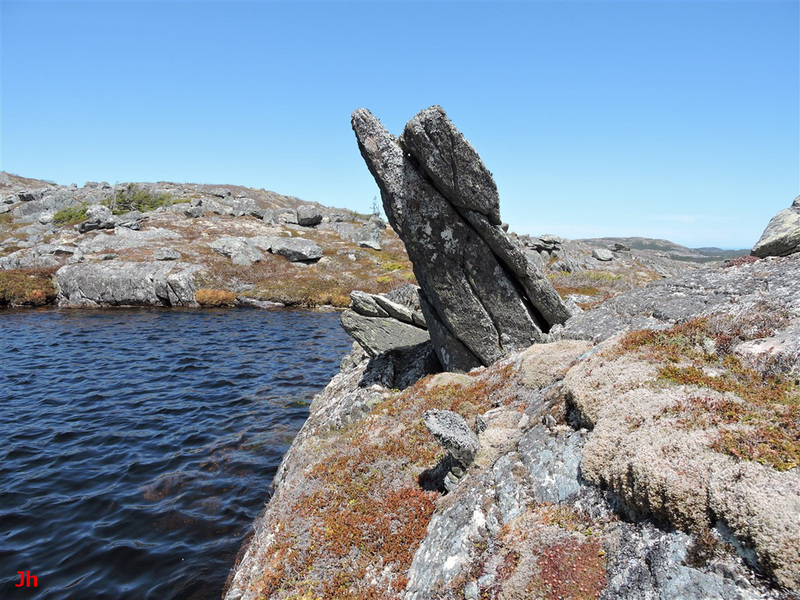 In both cases, the well-developed joint systems in the bedrock likely played a key role in transporting groundwater to the frost-heaved areas. The orthogonal joints also facilitated creation of the small fissures forming the boundaries of the frost-heaved blocks. 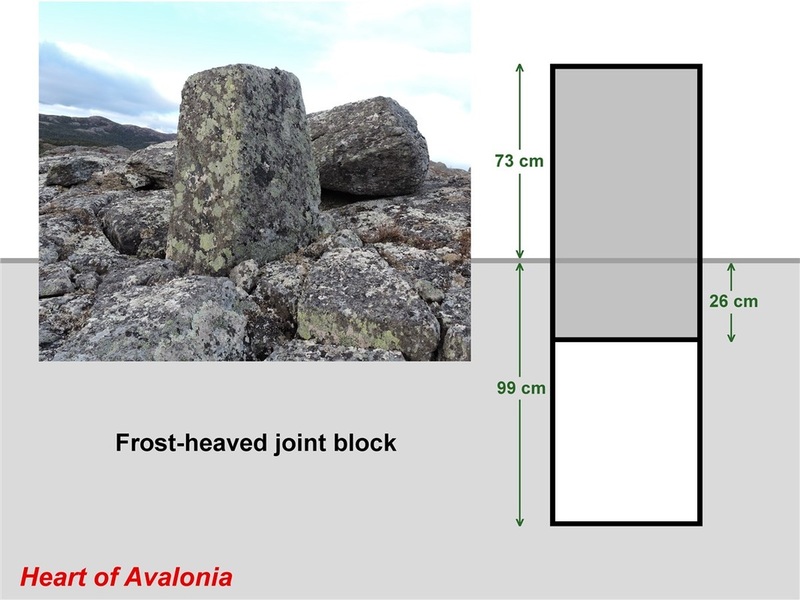 In the specimen illustrated above, a single frost-heaved joint block has separated into three pieces, each apparently undergoing a different amount of frost heave. Alternatively, all three pieces could have undergone identical frost heave initially, before independently settling part-way back into the open space underneath. Comparisons with other similar occurrences suggests that the first explanation is more probable. The hole beneath the joint blocks was partially filled with broken rock. This is very common. 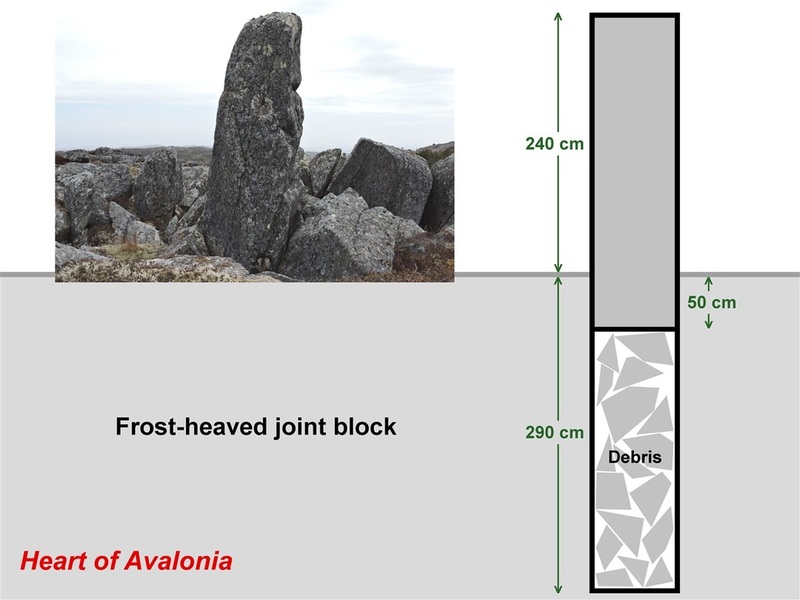 Frost wedging at the time of initial formation of the feature is a possible cause for the debris, as is freeze-thaw weathering occurring subsequently. 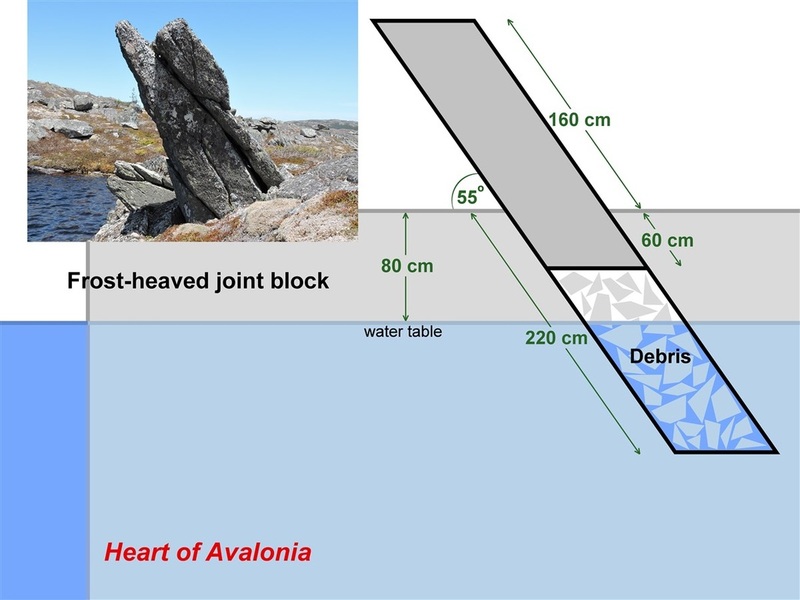 In some cases, loose rock underneath frost-heaved joint blocks appears to have been dislodged by pressure from roots growing in joints in the bedrock. 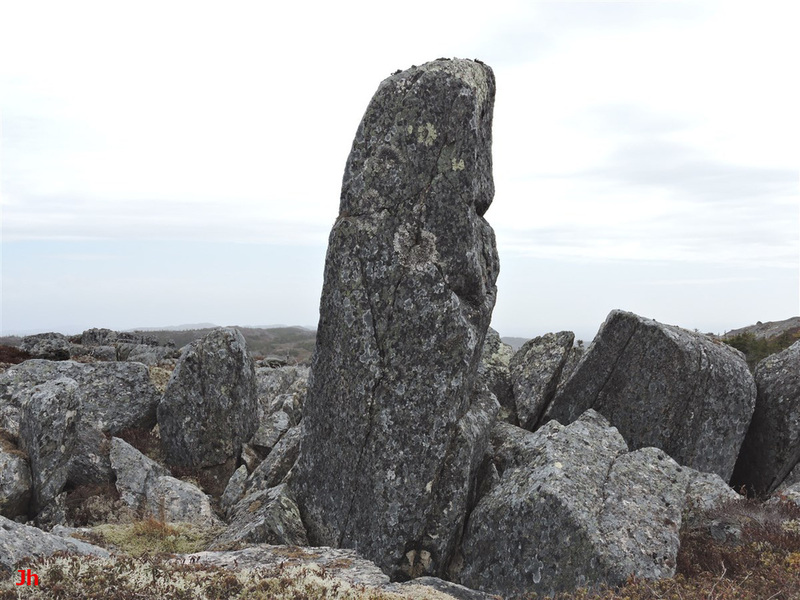 The specimen shown above is uncommonly tall and was formed in an area of widespread and severe frost-induced bedrock disruption. The above-ground height was measured relative to a small area of apparently intact bedrock seen in the left-center foreground of the photo. All of the other rock surrounding the feature was shifted by frost-heave action. The portion of the block extending below ground was measured by extending a measuring tape down into various gaps near the block. At least 50 cm of below-surface extension was confirmed, but measurements could not exclude the possibility of more than 50 cm of downward extension. The minimum measured total length of the block implies that the frost heave process for this block initiated at least 290 cm below the surface. This depth (potentially marking the lower limit of an active layer above permafrost) approximates the maximum depth of fissures observed in the area (see Fissures, pending). The large frost-heaved joint block pictured above is inclined at an angle matching the dip of longitudinal tectonic cleavage in the surrounding schistose volcanic (subsequently metasomatized) bedrock. 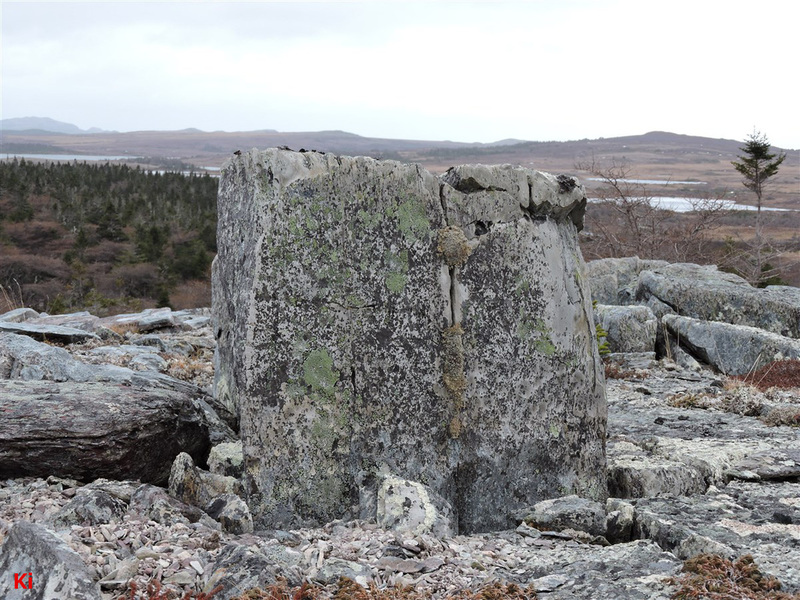 Note the small (20 cm high, lichen-covered) additional frost-heaved block appearing in the foreground of the photo (cropped out in the diagram) that is inclined identically. The blocks appearing behind the large block are more steeply inclined. 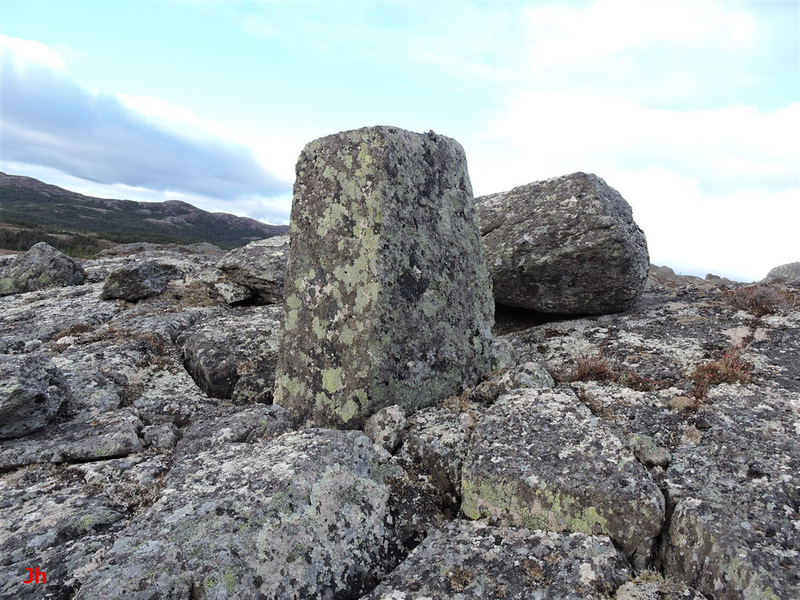 These blocks were entirely uprooted by frost heave and do not extend continuously back into the host bedrock. The present-day water table is indicated. There is probably no relationship between this water table and groundwater levels at the time the frost-heave feature was formed. An almost identical large frost-heave feature sits nearby at a slightly higher elevation, located about 60 m (horizontal displacement) from the illustrated feature. As with the immediately preceding example, it was not possible in this case to confirm the full extent of the below-surface portion of the frost-heaved block. The indicated dimension (60 cm) is a lower limit.